At the Due West Learning Gardens, we believe that learning outdoors should be inspiring, fun, and a little messy. 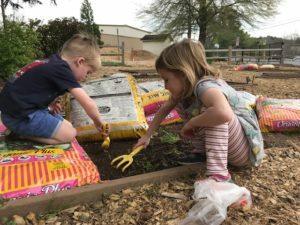 Teachers, parents, grandparents and community leaders alike have come together to provide students with opportunities for hands-on, project-based learning at Due West Elementary. Whether they are starting plant seedlings or observing wildlife in their natural habitat, every student can grow in their understanding and appreciation of the natural world. There are several ways to join in the fun at the Due West Learning Gardens. 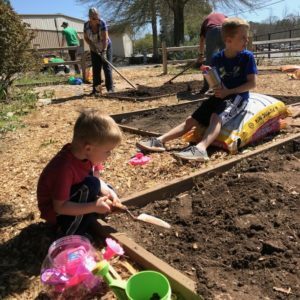 Become an Earth Parent for your child’s class and facilitate outdoor learning in a raised-bed vegetable garden. Sign up for one of our monthly work days to beautify the surrounding green space. Don’t like dirt? That’s OK! We need contractors, carpenters, irrigation specialists, writers, artists, cooks and more! Together we can both enrich and enhance our kids learning experience beyond the classroom door through the Due West Gardens. We invite you to follow us along on our growing journey.